2009 Top 10: #5 – Pearl Jam – “Backspacer” – Garage Dusty Exciting Car Team! “A return to form”. This sentence has been used so often in relation to Pearl Jam’s last few records that it has become an insufferable cliché. Not to mention the fact that it makes no sense – how can a band return to form when their previous record was also a return to form? So anyway, I’m not going to use that cliché here. I’ll just say that Backspacer is a really, really good record. Surprisingly so. Pearl Jam sound energised on Backspacer. No, not “re-energised”, just energised. The opening trio of Gonna See My Friend, Got Some and The Fixer shoot out of the gate with the vitality you’d expect of a band on album number 2, not 9 or whatever this is. Punk rock energy and grit abound, and the record is off to a good start. Slightly oddball Johnny Guitar follows, backed up by one of only 2 ballads on the album, the delicate Just Breathe. Most interestingly, the anger that gave their previous release its character is almost completely absent here. Listening to the self titled album now is like listening to something from another time – it was released with Bush in power and still enjoying at least a modicum of support – and Pearl Jam’s decision not to rehash the last record in changing times is a welcome one. In place of that anger this time around there is a looser, more celebratory feel. The songs are by no means lightweight, but they don’t carry the heavy themes that characterised the self titled release. This is not to say that Backspacer is stronger or weaker than the last record as a result of the change of theme – just different and, as with the self titled album, of its time. With each record this decade Pearl Jam have edged ever closer to being the punk band that they always seemed to want to be, and Backspacer continues the trend. The band’s shortest full length to date at just over 30 minutes, the record consists largely of quick, punchy, visceral songs. The pace varies slightly throughout, but the theme remains constant. 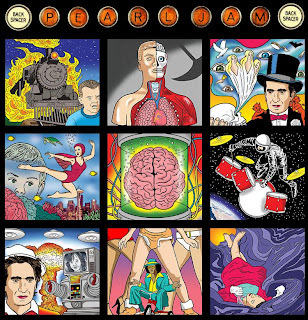 The album’s two highlights come right at the end, with the soaring classic rock influenced Force Of Nature boasting the most impressive lyrics on the album (climaxing with “one man stands alone, awaiting, for her to come home”) followed by possibly the saddest song Pearl Jam has ever recorded. The End tells the story of a man on his death bed, and the song’s final seconds (which I won’t ruin for you – go buy the record and listen closely) contain one of the most moving moments I’ve ever heard. Sometimes the smallest things can have the biggest impact. Sounding strong and vital, Pearl Jam have shown once again on Backspacer that longevity does not necessarily go hand in hand with irrelevance (unless you’re U2). Here’s to the next 20 years.